Cranab harvester cranes are developed for thinning and light final felling. The cranes have been designed for efficient, high-precision handling for advanced jobs across the working area. 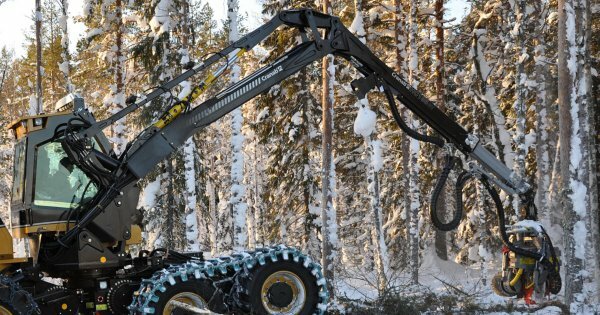 The Cranab HC185 - optimised forestry technology through and through. The parallel harvester crane is a strong tool for single action harvesters in final felling and tough thinning, and never compromises on performance! The slewing, lifting and telescopic functions are powerful and well-dimensioned. The crane also boasts a geometry that provides good reach and an impressive lifting height. The crane is easy to manoeuvre with great precision and high efficiency across the entire working area. Its meticulous construction and high material quality make the Cranab HC185 capable of both felling and processing within extensive reaches. The HC185 can also be supplied with a fixed base plate without a slewing motor, making it ideal for installation onto most harvesters. Thanks to the low-flux parallel function, the crane is extremely energy efficient. Its low centre of gravity and short crane column produce a sturdy machine with good visibility from the cab. The Cranab HC185 and its uncomplicated structure guarantee operational reliability and easy servicing. Separate, low-set lubrication points for safer lubrication come as standard, as does the outer boom lighting that illuminates the harvester head at close range. As always, Cranab’s well-organised hose routing provides sound protection against external influences.